Last week,after almost nine months from Kellie’s Sutton death, her partner, Steven Gane has been found guilty of coercive and controlling behaviour. It’s a landmark case in the implementation of the relative legislation, as the concept has only been criminalised in 2015 and it’s the first time a conviction has been determined after the victim’s death. ‘Gaslightning’ was first introduced in 1944 from the Hollywood movie “Gas Light” in which a killer makes his wife think she is losing her mind. Used as a manipulative tactic to deliberately make the other person or entity question the reality they live, it has not taken long before the technique has got everybody talking in a society, where mental health and women independence are of extreme relevance. WHAT ARE THE SIGNS OF THIS TACTIC? – In order to gain power over somebody else, perpetretors tell obvious lies with a straight face, leading the victim to be confused regarding anything that is being said to them. – They deny everything the victim has seen or heard, even when they have got witnesses. The process is gradual and the more the victim doubts of their life, the better the gaslighter plan work. – Looking at gaslighter behaviour over time, often their actions don’t match their words. Gaslighters try to bring the victim down all the time,making them believe to have no values, and randomly praise them for their quality. This aggravates the situation bringing a sense of uneasiness. The victim start believing their abuser is, after all, not that bad. – Gaslighters know really well the people dear to the victim, therefore they try to align them against the vulnerable individual, making them believe nobody is safe to trust. Indeed, all the gaslighters are looking for is isolation which will then force the victim to only trust their abuser giving them more power to control. Although in a strenuous and abusive relationship, gaslightning victims can sometimes spot the issue themselves, according to Robin Stern, author of the book “The Gaslight Effect: How to Spot and Survive the Hidden Manipulation Others Use to Control Your Life,”. HOW CAN YOU HELP A VICTIM? Unfortunately, there is no specific support for the victims of such relationships. The first step is to recognise there is an issue within the couple (please note, the problem is not confined to couple, but could involve an entire family, or work relationships) and eventually seek help consulting a psychiatrist, psychologist, or therapist. Experts can help the victim explore fear and doubts arisen from the experience they have been through and eventually assist them with the development of coping skill to manage their anxiety. Rekindle and bond with people the victim has been isolated from is suggested by experts as the most effective way to regain control over reality, life balance and reinforce the sense of worthiness. If you believe somebody you know is involved in a gaslightning relationship, you can seek advice contacting the National Domestic Violence Hotline or calling 1-800-799-7233. HOW DID GASLIGHTNING ENTER POLITICS? The term ‘gaslightning’ became one of the most popular words in 2017 along with ‘fake news’,during the beginning of the most controversial American presidency. Trump elected president of United States in January of last year has been then proclaimed by the CNN and other media outlets as nation’s gaslighter in chief. Journalists from all over the world trying to uncover and report the truth have had an hard time. Life, during the Trump’s era, has become fuzzy, a blurred line between the dream of making America great again and daily routine. American citizens have been affected the most. 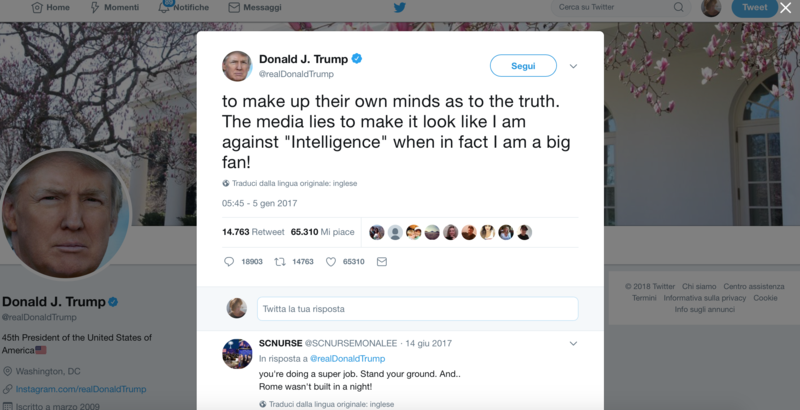 During the long campaign for presidency, people asked themselves if the future Prime Minister was an actual fan of the Intelligence or against it, belittling the intelligence professionals work through mock quotes during the ongoing Russia hacking investigation. Americans had to assist to the falsehood of Trump winning the election by a landslide, when instead was a clear narrow victory. J. Pitney, professor of American Politics at Claremont McKenna College, elaborated a chart showing the Electoral College share won by every president since George Washington and found that Trump’s margin of victory ranked 46th out of 58 U.S. presidential elections. You can find the complete list here. And besides that, people had to ascertain if Trump had mocked a disabled reporter or their eyes were lying to them showing something that had never happened in reality,like in the “Gas Light” movie when the killer dims the gaslights and pretends it’s only the wife who thinks they are twinkling, even when the room starts getting darker. The list of statements and actions made by Trump is still long and people still have to get used to the gaslightning term gaining popularity in parlance, as new forms of political and domestic abuse take place at various rates across different countries, with the same goal of disorientating victims in order to obtain power and total control. All genres of relationship are subject to some form of gaslighning, but before we reach a definite understanding of the phenomenon, it’s essential that we don’t end up flattening it and it will start to mean nothing. We cannot apply the term to all deceptive behaviours, but only in case of manipulative operations. The next step is to protect the victims in all circumstances, from dictators, bully leaders and abusive partners.